Remembering the History of Space Shuttle Challenger and Honor the Lives Lost on STS-51-L. This is a joint project between HAL5 and Huntsville's Challenger Elementary School to commemorate the 30th anniversary of the Space Shuttle Challenger (STS-51-L) accident. 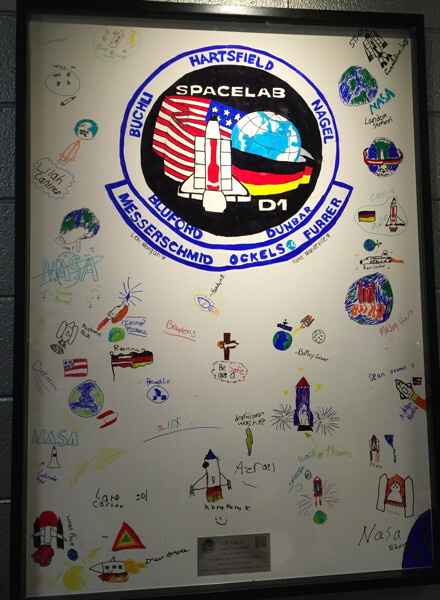 The commemoration wall is based on a series of whiteboard drawings, done by all of the Pre-K through 5th grade students, similar to those found in Launch Control Center at Kennedy Space Center (KSC) to honor the memories of all of the Space Shuttle Challenger flights. Below is an extract from HAL5 article on the project in NSS Ad Astra Magazine (Volume 28, Number 2, Summer 2016). A PDF copy of the article can be found here. On January 28, 2016, people across the country commemorated one of the saddest days in space exploration history: the 30th anniversary of the Space Shuttle Challenger accident. Speeches were given, model rockets launched, and moments of silence were observed to honor the seven astronauts who gave their lives in pursuit of humanity’s goal to reach the stars. With the help from the Huntsville Alabama L5 Society (HAL5), one school in Huntsville, Alabama, did something unique to commemorate the event. HAL5 President Yohon Lo and his friend, Lisa Bollinger, who was on the Parent Teacher Association of the Huntsville Challenger Elementary School, were pondering the activities to commemorate the 30th anniversary of the Space Shuttle Challenger accident for which the school was named. Various ideas were considered before Yohon suggested lining the walls of the school to look like the mission white boards that lined the walls at the Kennedy Space Center (KSC) Launch Control Center (LCC). The whiteboards were started after the Challenger accident, on STS-26 and continued until the last Space Shuttle flight. Each whiteboard is unique. They were drawn by the children of the astronauts to capture their feelings and thoughts on the launch day. Yohon and Lisa decided to do a mission whiteboard for each of the successful Challenger missions with the students, as it would be a great way for each class to be connected to a specific flight. Pre-kindergarten to 5th graders were divided into nine groups for each of the nine successful missions, with the teachers and staff addressing STS-51-L. In a way, each class has their ‘adopted astronaut parents’ on that flight. Creating a Challenger mission whiteboard was an attempt to recreate that feeling and thoughts about their mission. There were a lot of space firsts on these nine Challenger flights. A few HAL5 officers like Yohon Lo, Robert Bijvoet and David Hewitt covered some of the flights. HAL5 also reached out to friends from NASA and Boeing to present like: Dr. Sabrina Savage, a planetary scientist, talked about the STS-7 that carried the first American woman into space; Myrn Fletcher, an African-American engineer from Boeing, discussed STS-8, which carried the first African-American into space; and Jon Patterson, a NASA vehicle management engineer, presented on the first and only shuttle mission to carry out an ascent abort on STS-51-F [Editorial Note: Abort to Orbit]. These presenters talked about the astronauts that few on each mission, where they were from, any fun and interesting experiments they did on the flight, and answered questions. Lisa had the hard job of the logistics of securing additional sponsors and getting the finished products mounted. The commemoration wall was dedicated on evening of January 28 to a full crowd of about 500 students, parents, the public, and invited guests. Keynote speaker Todd May--Acting Director (now Director) of NASA Marshall Space Flight Center, gave a very upbeat speech, encouraging the kids to study hard and reach for the stars. This was followed by a chorus by the Challenger Middle School choir, and a quick summary of what we learned about each of the Challenger mission from a representative from each class. The funniest moment was a fifth grader regaling an experiment to test whether Coke or Pepsi has more fizz in space on STS-51-F, and share that experiment on STS-51-F, astronauts preferred Tang! That drew a round of laughs from the audience. The event wrapped up with a personal video by Michael Ciannilli the Apollo, Challenger, Columbia Lessons Learned Program Manager at KSC, who shared the history of the whiteboards as well as the importance of space explosration. Like Todd May, he emphasized the importance of studying hard to explore the stars. 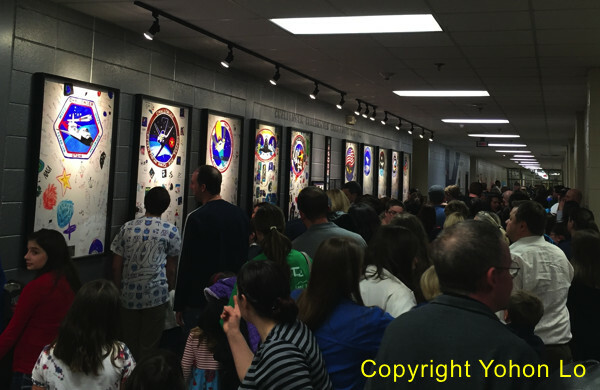 The commemoration wall received lots of compliments and acclaims from all, especially parents and Huntsville City School Board. The School Board did an excellent job showcasing the wall. For more information about the project please visit the website: www.challengerelementary.org. Our deepest thanks to Challenger Elementary School for giving us this opportunity. We believe it will make an impact on the students’ lives, and motivates them to learn and aspire to careers in science and engineering.